Sasatinnnie is a cosmetics and skincare line by Sasa. I can't remember the price of these nail polishes since I brought them when I was in Hong Kong, it something like 2 for $10. Like most Asian nail polishes these nail polishes don't have names. 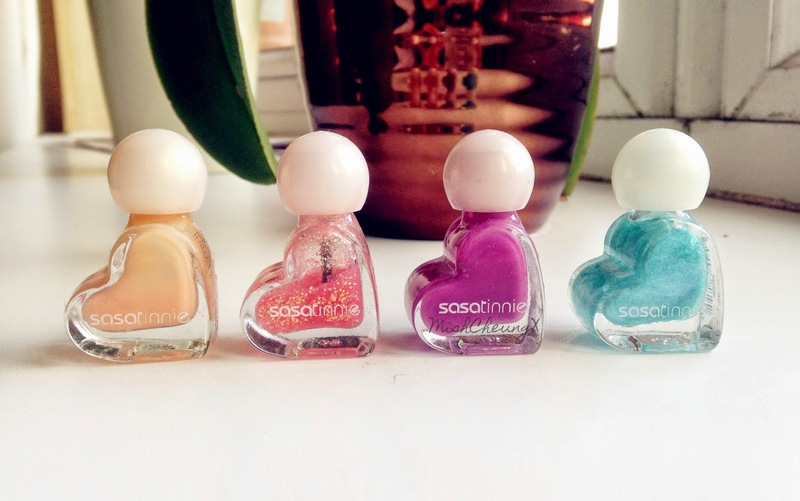 The heart shaped packaging of the nail polishes is very cute and unique. The cuteness triggered my urge to purchase them! >.< The downside of the packaging however, is that once you use the nail polish pass half way of the bottle, its quite difficult to reach the remaining nail polish. A nudy pale orange colour. The formula is very smooth and applies nicely. The polish dries quickly. However it is very sheer. It took me 3 coats to achieve an opaque colour, even still the nail peeks through the polish a little. Since there is little amount of nail polish, this will finish up within 2 to 3 uses, since you need to apply 3 coats for a solid colour. It has a nice jelly shine finish. It lasted for around 1 without topcoat. Would I Repurchase? 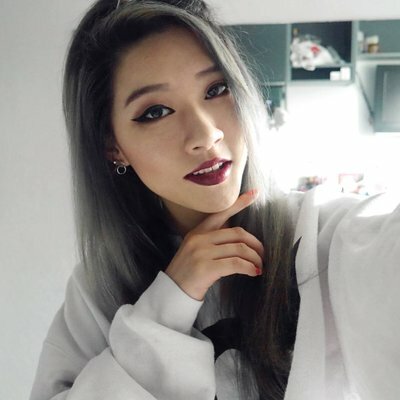 : No - I do love the colour but I don't have patience to build up so many coats every time. Also since the bottle is so small, it will finish up quickly. 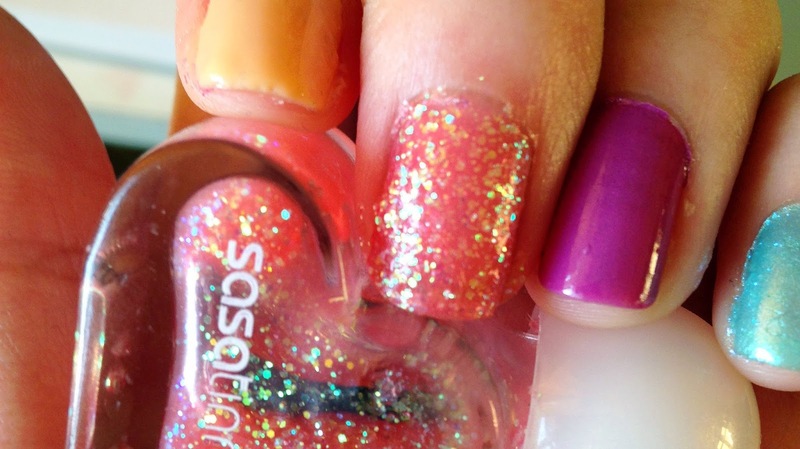 A glitter nail polish - transparent coral pink polish with gold iridescent glitter. The formula was smooth and applied nicely even with the glitters. I like how this polish has loads of glitters, it has more glitters than other polishes I own. 1 coat is enough for the prettiness of the glitter to show, but I applied 2 just so its more opaque and has more glitters! It has a slight rough finish due to the glitters, the finish of the polish is slightly matte. This one lasted 3 days before it started chipping. The con with this polish, is that after a while the consistency becomes thicker and hard to work with. Would I Repurchase? 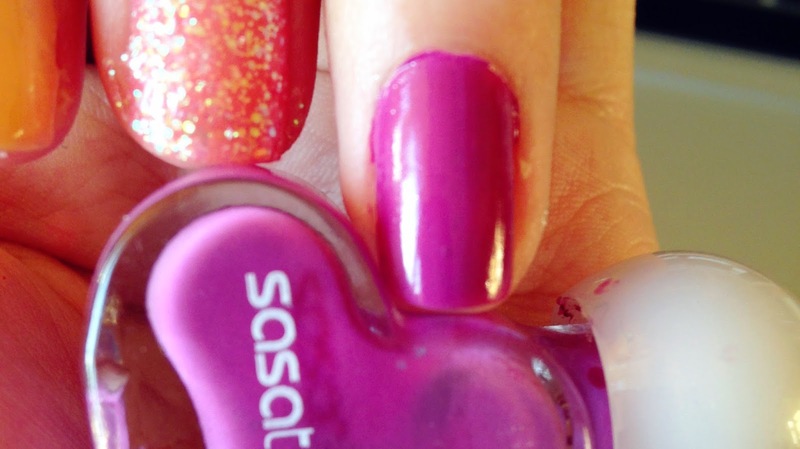 : Yep - the colour is very pretty and it has loads of glitters! A pinky purple colour. 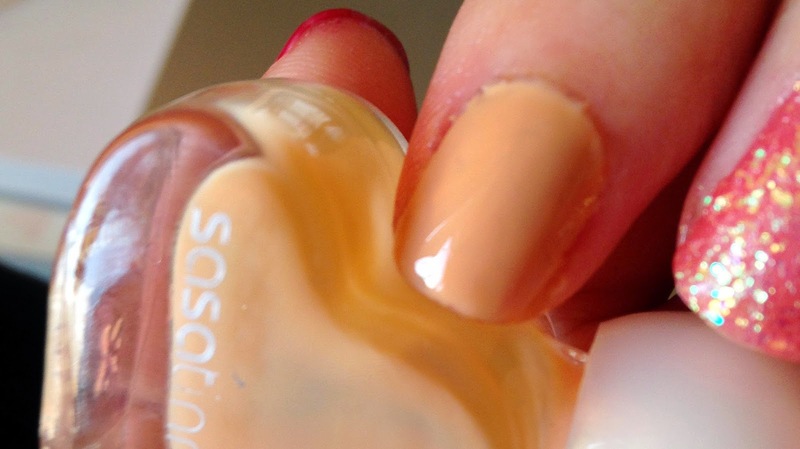 This colour was the most opaque out of the 4 shades I own; 1 coat was even for the full opacity. This will properly last for a good 5-7 use. Once again the formula was smooth. The finish is like a standard nail polish with shine and lasted for a week without top coat. Would I Repurchase? : Yes - it has the highest quality out of all 4, smooth formula and pigmented. A aqua blue colour, with blue iridescent shimmer. The formula of this is one is the most sheer out of the 4; it took me 4 coats to achieve an opaque colour, the nail does peeks through the polish a little. It has beautiful finish, you can see the blue iridescent shimmers sparkle and it has a nice shine. This one also lasted for one week without topcoat. Would I Repurchase? : No - beautiful finish however I definitely don't have the patience for 4 coats!